"War on Christmas" and "holiday tree" redirect here. For the brief cessation of hostilities during World War I, see Christmas truce. For trees decorated around Christmas time, see Christmas tree. Controversy has arisen regarding the celebration, recognition, legitimization, or acknowledgment of the Christmas holiday (or lack thereof) in government, media, advertising, retail, and various secular and religious environments throughout the holiday's history. In the 17th century, the Puritans had laws forbidding the celebration of Christmas, unlike the Catholic Church or the Anglican Church, the latter of which they separated from. With the atheistic Cult of Reason in power during the era of Revolutionary France, Christian Christmas religious services were banned and the three kings cake was forcibly renamed the "equality cake" under anticlerical government policies. Later, in the 20th century, Christmas celebrations were prohibited under doctrine of the state atheism in the Soviet Union. In the USSR, the League of Militant Atheists encouraged school pupils to campaign against Christmas traditions, such as the Christmas tree, and encouraged them to spit on crucifixes as protest against this holiday; the League established an antireligious holiday to be the 31st of each month as a replacement. Likewise, in Nazi Germany, "because Nazi ideologues saw organized religion as an enemy of the totalitarian state, propagandists sought to deemphasize—or eliminate altogether—the Christian aspects of the holiday" and as a result "propagandists tirelessly promoted numerous Nazified Christmas songs, which replaced Christian themes with the regime's racial ideologies." Modern-day controversy, often associated with use of the term "war on Christmas", occurs mainly in countries such as the United States, Canada, and to a much lesser extent the United Kingdom. This often involves objections to government or corporate avoidance of the day's association with Christianity in efforts to be multiculturally sensitive. In some cases, popular aspects of Christmas, such as Christmas trees, lights, and decorating are still prominently showcased, but are associated with unspecified "holidays" rather than with Christmas. The controversy also includes objections to policies that prohibit government or schools from forcing unwilling participants to take part in Christmas ceremonies. In other cases, the Christmas tree, as well as Nativity scenes, have not been permitted to be displayed in public settings altogether. Also, several US chain retailers, such as Walmart, Macy's, and Sears, have experimented with greeting their customers with "Happy Holidays" or "Season's Greetings" rather than with "Merry Christmas". Some opponents have denounced the generic term "Holidays" and avoidance of using the term "Christmas" as being politically correct. There is controversy concerning the date of 25 December as the birthday of Jesus. Many customs from these holidays, particularly from the pagan Scandinavian and Germanic celebration of Yule in northern Europe, are transparently present in later Christmas customs, suggesting that the date was appropriated directly from pagan customs and given a Christian veneer rather than being the true birthday of Jesus. The pagan Scandinavian and Germanic people of northern Europe had a celebration called Yule (also called Jul, Julblot, jólablót, midvinterblot, julofferfest) that occurred near the winter solstice. Some folklorists assert that many modern Christmas traditions, such as the Christmas tree, the Christmas wreath, the Yule log, and others, may be descended from Yule customs. Scandinavians still call Yule "Jul". In English, the word "Yule" is often used in combination with the season "yuletide"  a usage first recorded in 900. It is believed that the celebration of this day was a worship of these peculiar days, interpreted as the reawakening of nature. The Yule (Jul) particular God was Jólner, which is one of Odin's many names. Midvinterblot. Painting by Carl Larsson in the Swedish National museum's stairway. The concept of Yule (Jul) occurs in a tribute poem to Harold Hårfager from about AD 900, where someone said "drinking Jul". Julblot is the most solemn sacrifice feast. At the julblotet, sacrifices were given to the gods to earn blessing on the forthcoming germinating crops. Julblotet was eventually integrated into the Christian Christmas. As a remainder from this Viking era, the Midsummer is still important in Scandinavia, and hence vividly celebrated. Sol Invictus ("The Unconquered Sun") was originally a Syrian god who was later adopted as the chief god of the Roman Empire under Emperor Aurelian. His holiday is traditionally celebrated on 25 December, as are several gods associated with the winter solstice in many pagan traditions. The first documented Christmas controversy was Christian-led, and began during the English Interregnum, when England was ruled by a Puritan Parliament. Puritans sought to remove elements they viewed as pagan (because they were not biblical in origin) from Christianity (see Pre-Christianity above). In 1647, the Puritan-led English Parliament banned the celebration of Christmas, replacing it with a day of fasting and considering it "a popish festival with no biblical justification", and a time of wasteful and immoral behavior. Protests followed as pro-Christmas rioting broke out in several cities and for weeks Canterbury was controlled by the rioters, who decorated doorways with holly and shouted royalist slogans. The book The Vindication of Christmas (London, 1652) argued against the Puritans, and makes note of Old English Christmas traditions, dinner, roast apples on the fire, card playing, dances with "plow-boys" and "maidservants", old Father Christmas and carol singing. The Restoration of King Charles II in 1660 ended the ban. Poor Robin's Almanack contained the lines: "Now thanks to God for Charles return, / Whose absence made old Christmas mourn. / For then we scarcely did it know, / Whether it Christmas were or no." Many clergymen still disapproved of Christmas celebration. In Scotland, the Presbyterian Church of Scotland also discouraged observance of Christmas. James VI commanded its celebration in 1618, but attendance at church was scant. In Colonial America, the Pilgrims of New England held radical Protestant disapproval of Christmas. The Plymouth Pilgrims put their loathing for the day into practice in 1620 when they spent their first Christmas Day in the New World building their first structure in the New World – thus demonstrating their complete contempt for the day. Non-Puritans in New England deplored the loss of the holidays enjoyed by the laboring classes in England. 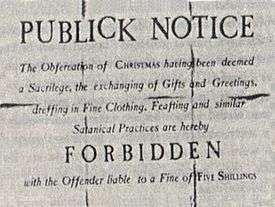 Christmas observance was outlawed in Boston in 1659. The ban by the Puritans was revoked in 1681 by an English appointed governor, Edmund Andros, however it was not until the mid-19th century that celebrating Christmas became fashionable in the Boston region. By the Declaration of Independence in 1776, it was not widely celebrated in the US. Prior to the Victorian era, Christmas in the United States was primarily a religious holiday observed by Roman Catholics, Episcopalians, and Lutherans. Its importance was often considered secondary to that of Epiphany and Easter. As was the case with other Christian holidays, Christmas borrowed elements from pagan peoples, including yule logs and decorations such as candles, holly, and mistletoe. Christmas trees were seen as pagan in origin. During the various Protestant reformations, these paganizing elements were a source of controversy. Some sects, such as the Puritans, rejected Christmas as an entirely pagan holiday. Others rejected certain aspects of Christmas as paganizing, but wanted to retain the "essence" of the holiday as a celebration of the Christ's birth. This tension put in motion an ongoing debate within some Protestant denominations about the proper observance of Christmas. According to historian Ronald Hutton, the current state of observance of Christmas is largely the result of a mid-Victorian revival of the holiday, spearheaded by Charles Dickens. In A Christmas Carol, Hutton argues, Dickens sought to construct Christmas as a family-centered festival of generosity, in contrast to the community-based and church-centered observations, the observance of which had dwindled during the late 18th and early 19th centuries. Modern celebrations of Christmas include more commercial activity, compared to the more religious celebrations of the past. Historian Stephen Nissenbaum contends that the modern celebration in the United States was developed in New York State from defunct and imagined Dutch and English traditions in order to refocus the holiday from one where groups of young men went from house to house demanding alcohol and food into one centered on the happiness of children. He notes that there was a deliberate effort to prevent children from becoming greedy in response. Christmas was not proclaimed a holiday by the United States Congress until 1870. "It is not lawful, O Stranger, for us to change the date of Crissmas, but would that Zeus would put it into the minds of the Niatirbians to keep Exmas at some other time or not to keep it at all. For Exmas and the Rush distract the minds even of the few from sacred things. And we indeed are glad that men should make merry at Crissmas; but in Exmas there is no merriment left." And when I asked him why they endured the Rush, he replied, "It is, O Stranger, a racket. . ."
The December 1957 News and Views published by the Church League of America, a conservative organization co-founded in 1937 by George Washington Robnett, attacked the use of Xmas in an article titled "X=The Unknown Quantity". The claims were picked up later by Gerald L. K. Smith, who in December 1966 claimed that Xmas was a "blasphemous omission of the name of Christ" and that "'X' is referred to as being symbolical of the unknown quantity." Smith further argued that Jews introduced Santa Claus to suppress the New Testament accounts of Jesus, and that the United Nations, at the behest of "world Jewry", had "outlawed the name of Christ". There is, however, a well documented history of use of Χ (actually a chi) as an abbreviation for "Christ" (Χριστός) and possibly also a symbol of the cross. The abbreviation appears on many Orthodox Christian religious icons. The Soviet Union, and certain other Communist regimes, banned overtly religious Christmas observances. Most customs traditionally associated with Christmas, such as decorated trees, presents, and Ded Moroz (Father Frost), were later reinstated in Soviet society, but tied to New Year's Day instead; this tradition remains as of the present day. It should, however, be noted that most Russian Christians are of the Orthodox community, whose religious festivals (Christmas, Easter etc.) 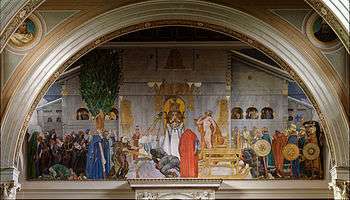 do not necessarily coincide precisely with those of the main western Christian churches (Catholic or Protestant), because of continued connection of the church calendar to the Julian calendar. The expression "the War on Christmas" has been used in the media to denote Christmas-related controversies. The term gained notability due in part to its use by conservative commentators such as Peter Brimelow and Bill O'Reilly beginning in the early 2000s. The claim of Brimelow, O'Reilly and others was that any specific mention of the term "Christmas" or its religious aspects was being increasingly censored, avoided, or discouraged by a number of advertisers, retailers, government (prominently schools), and other public and secular organizations. In the United States and Canada, where the use of the term "Holidays" is most prevalent, opponents have denounced its usage and avoidance of using the term "Christmas" as being politically correct. Jeff Schweitzer, a commentator for The Huffington Post, addressed the position of commentators such as O'Reilly, stating that "There is no war on Christmas; the idea is absurd at every level. Those who object to being forced to celebrate another's religion are drowning in Christmas in a sea of Christianity dominating all aspects of social life. An 80 percent majority can claim victimhood only with an extraordinary flight from reality." Heather Long, an American columnist for The Guardian, addressed the "politically correct" question in America over use of the term "holidays", writing, "people who are clearly celebrating Christmas in their homes tend to be conflicted about what to say in the workplace or at school. No one wants to offend anyone or make assumptions about people's religious beliefs, especially at work." Christmas Day is recognized as an official federal holiday by the United States government. The American Civil Liberties Union and Americans United for Separation of Church and State argue that government-funded displays of Christmas imagery and traditions violate the U.S. Constitution—specifically the First Amendment, which prohibits the establishment by Congress of a national religion. The debate over whether religious displays should be placed within public schools, courthouses, and other government buildings has been heated in recent years. Supreme Court rulings, starting with Lynch v. Donnelly in 1984, have permitted religious themes in government-funded Christmas displays that had "legitimate secular purposes". Since these rulings have been splintered and have left governments uncertain of their limits, many such displays have included secular elements such as reindeer, snowmen and elves along with the religious elements. Other recent court cases have brought up additional issues such as the inclusion of Christmas carols in public school performances, but none of these cases have reached the US Supreme Court. A controversy regarding these issues arose in 2002, when the New York City public school system banned the display of Nativity scenes but allowed the display of less overtly religious symbols such as Christmas trees, Hanukkah menorahs, and the Muslim star and crescent. The school system successfully defended its policy in Skoros v. City of New York (2006). In 2007, a controversy arose when a public school in Ottawa, Ontario planned to have the children in its primary choir sing a version of the song "Silver Bells" with the word "Christmas" replaced by "festive"; the concert also included the songs "Candles of Christmas" and "It's Christmas" with the original lyrics. In 2011, in Embrun, Ontario, near Ottawa, some parents were displeased when a school replaced the Christmas concert it had held in previous years with a craft sale and winter concert scheduled for February. In November 2009 the city council of Dundee was accused of banning Christmas because it promoted its celebrations as the Winter Night Light festival, initially with no specific references to Christianity. Local church leaders were invited to participate in the event, and they did. Due to the changing religious landscape of the UK, Christmas cards featuring religious imagery, such as the Nativity scene or the Virgin and Child, have become less common in major retailers. However, they are still readily available from smaller shops, or those linked to church groups and charities. The Church of England complained in 2004 when religious images were removed from the annual tradition of special postage stamps around Christmas. The Christian holidays of Christmas Day and Good Friday remained in secular post-apartheid South Africa's calendar of public holidays. The Commission for the Promotion and Protection of the Rights of Cultural, Religious and Linguistic Communities (CRL Rights Commission), a chapter nine institution established in 2004, held countrywide consultative public hearings in June and July 2012 to assess the need for a review of public holidays following the receipt of complaints from minority groups about unfair discrimination. The CRL Rights Commission stated that they would submit their recommendations to the Department of Home Affairs, the Department of Labour, various Portfolio Committees and the Office of the Presidency by October 2012. The CRL Rights Commission published its recommendations on 17 April 2013, including the scrapping of some existing public holidays to free up days for some non-Christian religious public holidays. The common practice of schoolchildren visiting local churches for Christmas masses in December is opposed by the Norwegian Humanist Association, the Children's Ombudsman and by the Union of Education. There have been several local controversies over the issue. The political parties have mostly been in favor of this being decided by the schools themselves, but the government has underlined that schools who participate in Christmas masses must offer an alternative for pupils who don’t want to attend and that masses must not take place on the day that marks the closing of schools before the Christmas holiday. The Solberg's Cabinet says in its government declaration that it looks positively upon schools taking part in masses in churches before religious holidays. According to a 2013 poll by Norstat for Vårt Land, 68% of Norwegians support having school-arranged Christmas masses while 14% are opposed. 17% do not hold any opinion on the issue. A school law in 2011, which explicitly stated that public schools should be non-confessional, led to debate over what this meant for the tradition that schools gather in churches in December to celebrate advent, Lucia or Christmas. 80,000 Swedes signed a 2012 protest letter (Adventsuppropet) initiated by the newspaper Dagen to Minister for Education Jan Björklund where they demanded that school visits to churches should still be allowed to include religious rituals. The minister clarified that church visits before Christmas might include singing of Christmas hymns and a priest talking about the Christmas gospel while on the other side common prayers and reading a Confession of Faith would violate the law. In 2012, Sveriges Radio reported that about one of six schools had changed the way they mark Christmas traditions as a result of the new law. In 2007, U.S. hardware store chain Lowe's published a catalog that accidentally referred to Christmas trees as "Family trees"
Since the 1980s, there have been several instances in both the United States and Canada when official public mentions and references to Christmas trees were renamed to "holiday trees". Reaction to such renamings has been mixed. One of the most prominent Christmas tree controversies came in 2005, when the city of Boston labeled their official decorated tree as a holiday tree, and the subsequent response from the Nova Scotian tree farmer who donated the tree was that he would rather have put the tree in a wood chipper than have it named a "holiday" tree. In 2009 in Jerusalem, Israel, the Lobby for Jewish Values, with support of the Jerusalem Rabbinate, handed out fliers condemning Christmas and called for a boycott of "restaurants and hotels that sell or put up Christmas trees and other 'foolish' Christian symbols". The Brussels Christmas tree in the Belgian capital sparked controversy in December 2012, as it was part of renaming the Christmas Market as "Winter Pleasures". Local opposition saw it as appeasement of the Muslim minority in the city. Reclamation of the term "Christmas tree"
Efforts have also been made to rename official public holiday trees back to Christmas trees. In 2002, a bill was introduced in the California Senate to rename the State Holiday Tree the California State Christmas Tree; while this measure did not pass, at the official lighting of the tree on 4 December 2007, California Governor Arnold Schwarzenegger referred to the tree as a Christmas tree in his remarks and in the press release his office issued after the ceremony. Schwarzenegger had previously ended the secular practice of calling it a "holiday tree" in 2004 during the 73rd annual lighting. The name change was in honor of the late Senator William "Pete" Knight. Schwarzenegger said at Knight's funeral that he would change the name back to Christmas tree. Knight had lobbied unsuccessfully to change the name after Governor Davis decided to call it a holiday tree. The Michigan Senate had a debate in 2005 over whether the decorated tree in front of the Michigan Capitol would continue to be called a holiday tree (as it had been since the early 1990s) or named a Christmas tree. The question was revisited in 2006, when the bipartisan Michigan Capitol Committee voted unanimously to use the term Christmas tree. And in 2007, Wisconsin lawmakers considered whether to rename the tree in the Wisconsin Capitol rotunda, a holiday tree since 1985, the Wisconsin State Christmas Tree. Since at least 2005, religious conservative groups and media in the United States, such as the American Family Association (AFA) and Liberty Counsel—which are both classified as hate groups by the Southern Poverty Law Center, have called for boycotts of various prominent secular organizations, particularly retail giants, demanding that they use the term "Christmas" rather, than solely "holiday" in their print, TV, online, and in-store marketing and advertising. This was also seen by some as containing a hidden anti-Jewish message. All of the major retailers named denied the charges. The Sears Holdings Corporation (which owns Sears and Kmart) altered their marketing policies from using the term "holiday" to using the term "Christmas". The change of policy included the distribution of "Merry Christmas" signs to stores nationwide, and the changing of the term "holiday" to "Christmas" on their website and in stores. Kmart opened the 2006 Christmas season with their slogan "Where Christmas comes together", and several commercials acknowledging Christmas, including one with the tune to "Hark! The Herald Angels Sing". In 2005, Walmart was criticized by the Catholic League for avoiding the word "Christmas" in any of their marketing efforts. The company had downplayed the term "Christmas" in much of its advertising for several years. This caused some backlash among the public, prompting some groups to pass around petitions and threaten boycotts against the company, as well as several other prominent retailers that practiced similar obscurations of the holiday. In 2006, in response to the public outcry, Wal-Mart announced that they were amending their policy and would be using "Christmas" rather than "holiday". Among the changes, they noted that the former "Holiday Shop" would become the "Christmas Shop", and that there would be a "countin' down the days to Christmas" feature. When it was revealed in November 2006 that Wal-Mart would be using the term "Christmas" in their advertising campaign, an article about the issue initiated by USA Today pointed out that Best Buy Corporation would be among the retailers that would not be using "Christmas" at all in their advertising that year. Dawn Bryant, a Best Buy spokeswoman, stated: "We are going to continue to use the term holiday because there are several holidays throughout that time period, and we certainly need to be respectful of all of them." The AFA launched a campaign against Best Buy's policy. In reaction to the same policy, the Catholic League placed Best Buy on its 2006 Christmas Watch List. In 2005, despite other promotional material using the term "Christmas trees", an Austin, Texas location of the U.S. hardware retailer Lowe's used the term "Holiday tree" on a bilingual banner advertising its Christmas trees. However, the Spanish text underneath it inconsistently used the term "árboles de Navidad", which translates to "Christmas trees". Following complaints by the AFA, the company stated that it would remove the offending banners, and that "to ensure consistency of our message and to avoid confusion among our customers, we are now referring to the trees only as 'Christmas Trees.'" In 2007, the AFA complained that the chain's holiday catalog contained references to the term "Family trees" instead of "Christmas trees", despite all other promotional material using the term "Christmas tree". Lowe's admitted that the usage of "Family trees" was a proofreading error that had not been caught before the catalog was published. In late October 2008, U.S. hardware retailer The Home Depot was criticized by the AFA for using terms such as "holiday" and "Hanukkah" on their website, but avoiding the term "Christmas". The retailer responded by saying they will be adjusting their website to make references to Christmas more prominent. It was later claimed by Snopes.com that the AFA's characterization of Home Depot's advertising was false, as the retailer's advertising had initially included several references to the word "Christmas". On 11 November 2009, the AFA called for a "limited two-month boycott" of Gap, Inc over what they claimed was the "company's censorship of the word 'Christmas.'" In an advertising campaign launched by Gap on 12 November, the term "Christmas" was both spoken and printed on their website at least once, and a television ad entitled "Go Ho Ho" featured lyrics such as "Go Christmas, Go Hanukkah, Go Kwanzaa, Go Solstice" and "whatever holiday you Wanna-kah". On 17 November, AFA responded to this campaign by condemning the ads for references to the "pagan holiday" of solstice, and declined to call off the boycott. On 24 November, the AFA ended the boycott, after learning from Gap's corporate vice president of communications that the company planned to launch a new commercial with a "very strong Christmas theme". On 24 November 2010, the branch manager of Chase Bank in Southlake, Texas told Antonio Morales that a Christmas tree he had donated to the branch had to be taken down per JPMorgan Chase's policy to use only decorations supplied by the company. Bank spokesperson Greg Hassell stated that the company-provided decorations are designed to be "something everyone is comfortable with, regardless of how they celebrate the season." Also in 2010, Wachovia Bank was briefly rumored to have banned Christmas trees from its local branches in favor of poinsettias. In response to complaints, the company affirmed that Christmas trees were permitted to be displayed and decorated by branch employees. In November 2010, the word "Christmas" on two signs at Philadelphia's Christmas Village was removed by the organizers after complaints, but restored three days later after the mayor intervened. According to NetEase, on the Christmas Day of 2014, a "Boycotting Christmas" campaign launched in downtown Changsha, Hunan Province, China. Also in 2014, Northwest University closed the campus completely on the Christmas Eve, and all of the requests for leave were rejected by the school officials. In November 2015, the coffee shop chain Starbucks introduced Christmas-themed cups colored in solid red and containing no ornamentation besides the Starbucks logo, contrasting previous designs which featured winter-related imagery, and non-religious Christmas symbols such as reindeer and ornaments. On 5 November, a video was posted on Facebook by evangelist and self-proclaimed "social media personality" Joshua Feuerstein, in which he accused Starbucks of "hating Jesus" by removing Christmas-oriented imagery from the cup, followed by him "tricking" a barista into writing "Merry Christmas" on the cup, and encouraging others to do the same. The video went viral, spurring discussions and commentary: businessman and Republican 2016 president-elect Donald Trump supported Feuerstein's claim by suggesting a boycott of Starbucks, stating that "If I become president, we're all going to be saying 'Merry Christmas' again." Many social media users, including other Christians, perceived the criticism to be an overreaction. Christian sects and communities that reject the observance of Christmas for theological reasons include Jehovah's Witnesses; some adherents of Messianic Judaism; most Sabbatarian denominations, such as the True Jesus Church and the Church of God (7th-Day); the Iglesia ni Cristo; the Christian Congregation in Brazil; the Christian Congregation in the United States; and certain reformed and fundamentalist churches of various persuasions, including some Independent Baptist, Holiness, Apostolic Pentecostal, and Churches of Christ congregations. The celebration of Christmas has occasionally been criticized in countries which are predominantly Muslim. Turkey, whose population is 99.8 percent Muslim, has adopted a secular version of Christmas and a Santa Claus figure named Noel Baba (from the French Père Noël). During the 2013 holiday season, a Muslim youth group launched an anti-Santa Claus campaign, protesting against the celebration of Christmas in the country. In December 2015, political and religious activists organized protests against the growing influence of Christmas and Santa Claus in Turkish society. ↑ Lowe, Scott C. (2011). Christmas. John Wiley & Sons. ISBN 1444341456. On the mainland, seventeenth-century Puritan New England had laws forbidding the observance of Christmas. The Christian groups who broke with the Catholic Church and the Church of England deemphasized Christmas in the early colonial period. ↑ Mason, Julia (21 December 2015). "Why Was Christmas Renamed 'Dog Day' During the French Revolution?". HistoryBuff. Retrieved 31 October 2016. How did people celebrate the Christmas during the French Revolution? In white-knuckled terror behind closed doors. Anti-clericalism reached its apex on 10 November 1793, when a Fête de la Raison was held in honor of the Cult of Reason. Churches across France were renamed “Temples of Reason” and the Notre Dame was “de-baptized” for the occasion. The Commune spared no expense: “The first festival of reason, which took place in Notre Dame, featured a fabricated mountain, with a temple of philosophy at its summit and a script borrowed from an opera libretto. At the sound of Marie-Joseph Chénier‘s Hymne à la Liberté, two rows of young women, dressed in white, descended the mountain, crossing each other before the ‘altar of reason’ before ascending once more to greet the goddess of Liberty.” As you can probably gather from the above description, 1793 was not a great time to celebrate Christmas in the capital. ↑ Ramet, Sabrina Petra (2005). Religious Policy in the Soviet Union. Cambridge University Press. p. 138. ISBN 9780521022309. The League sallied forth to save the day from this putative religious revival. Antireligioznik obliged with so many articles that it devoted an entire section of its annual index for 1928 to anti-religious training in the schools. More such material followed in 1929, and a flood of it the next year. It recommended what Lenin and others earlier had explicitly condemned—carnivals, farces, and games to intimidate and purge the youth of religious belief. It suggested that pupils campaign against customs associated with Christmas (including Christmas trees) and Easter. Some schools, the League approvingly reported, staged an anti-religious day on the 31st of each month. Not teachers but the League's local set the programme for this special occasion. ↑ Zugger, Christopher Lawrence (2001). Catholics of the Soviet Empire from Lenin Through Stalin. Syracuse University Press. p. 210. ISBN 9780815606796. As observed by Nicholas Brianchaninov, writing in 1929–1930, after the NEP and just as the worst of collectivization was beginning, the Soviets deemed it necessary to drive into the heads of the people the axiom that religion was the synthesis of everything most harmful to humanity. It must be presented as the enemy of man and society, of life and learning, of progress. . . . In caricatures, articles, Bezbozhnik, Antireligioznik, League of Militant Atheists propaganda and films. School courses [were give] on conducting the struggle against religion (how to profane a church, break windows, objects of piety). The young, always eager to be with the latest trend, often responded to such propaganda. In Moscow in 1929 children were brought to spit on the crucifixes at Christmas. Priests in Tiraspol diocese were sometimes betrayed by their own young parishioners, leading to their imprisonment and even death, and tearing their families apart. 1 2 Bazar, Emily (1 December 2005). "Trimming 'Christmas' from Trees Stirs Debate". USA Today. Retrieved 11 August 2008. 1 2 3 4 Bishop, Tricia (24 November 2006). "Stores Revert to 'Merry Christmas'". Chicago Tribune. Retrieved 5 December 2006. 1 2 "Concert Goes Ahead Despite Controversy over Change to Christmas Lyrics". National Post. Retrieved 28 July 2008. ↑ "Premier Appeals for Tolerance in Courthouse Christmas Tree Debate". CBC News. 21 December 2006. Archived from the original on 3 February 2008. Retrieved 11 August 2008. 1 2 3 4 "The Brits Have It Right: Forget Happy Holidays, Just Wish People Merry Christmas". The Guardian. London. 16 June 2015. 1 2 3 Jankowski, Paul (16 June 2015). "Is Saying 'Merry Christmas' Politically Correct? Who Cares?". Forbes. ↑ "VA Bans Christmas Trees as Holiday Decorations in Public Areas". Spartanburg, SC: WSPA-TV. Retrieved 14 December 2015. Christmas trees will not be allowed at the Salem VA Medical Center this holiday season in public areas. 'Displays must not promote any religion. Please note that trees (regardless of the types of ornaments used) have been deemed to promote the Christian religion and will not be permitted in any public areas this year,' reads an email sent to employees. ↑ Porter, Joel. "Federal Judge Rules Against Concord High School Nativity Scene". South Bend, IN: WNDU-TV. Retrieved 14 December 2015. An Elkhart high school Christmas concert will have to scrap part of its performance following a court ruling. US district court judge Jon Deguilio granted the Freedom From Religion Foundation a preliminary injunction. That means Concord High School is not allowed to portray a live Nativity scene in its Christmas Spectacular, which opens in less than two weeks. ↑ "An Unmerried Woman". Snopes.com. Retrieved 25 December 2012. ↑ O'Donnell, Jayne (8 November 2006). "Wal-Mart Wishes You a Merry Christmas". USA Today. Retrieved 25 December 2012. 1 2 "If We Can't Say 'Merry Christmas' in Canada, Multiculturalism Failed". The Huffington Post. 16 June 2015. ↑ "Yule". The American Heritage Dictionary of the English Language (4th ed.). Retrieved 3 December 2006. ↑ Capoccia, Kathryn (2002). "Christmas Traditions". Retrieved 27 December 2008. ↑ Patiño, Marta. "The Puritan Ban on Christmas". Archived from the original on 21 November 2006. ↑ "Why Did Cromwell Abolish Christmas?". Oliver Cromwell. The Cromwell Association. 2001. Retrieved 28 December 2006. ↑ Durston, Chris (December 1985). "Lords of Misrule: The Puritan War on Christmas 1642–60". History Today. Vol. 35 no. 12. pp. 7–14. Archived from the original on 10 March 2007. ↑ Sandys, William (1852). Christmastide: Its History, Festivities and Carols. London: John Russell Smith. pp. 119–120. ↑ Miall, Anthony & Peter (1978). The Victorian Christmas Book. Dent. p. 7. ISBN 0-460-12039-5. ↑ Chambers, Robert (1885). Domestic Annals of Scotland. p. 211. 1 2 Barnett, James Harwood (1984). The American Christmas: A Study in National Culture. Ayer Publishing. p. 3. ISBN 0-405-07671-1. ↑ Innes, Stephen (1995). Creating the Commonwealth: The Economic Culture of Puritan New England. W.W. Norton & Company. p. 145. ISBN 978-0-393-03584-1. 1 2 3 "Top 10 Things You Didn't Know About Christmas". Time. 24 December 2008. ↑ "When Americans Banned Christmas". The Week. 20 December 2011. Retrieved 18 December 2014. ↑ Marling, Karal Ann (2000). Merry Christmas! : Celebrating America's Greatest Holiday. Harvard University Press. p. 44. ISBN 0-674-00318-7. ↑ Nissenbaum, Stephen (1997). The Battle for Christmas. New York: Vintage Books. ISBN 0-679-74038-4. ↑ Stations of the Sun: The Ritual Year in England. Oxford: Oxford Press. ISBN 0-19-285448-8. ↑ Lewis, C. S. "Exmas and Christmas: A Lost Chapter from Herodotus". ↑ "Subject Guide to Conservative and Libertarian Materials, in Manuscript Collections". University of Oregon. ↑ Kominsky, Morris (1970). The Hoaxers: Plain Liars, Fancy Liars and Damned Liars. pp. 137–138. ISBN 0-8283-1288-5. ↑ "Christian Symbols and Their Descriptions". Ancient-symbols.com. Retrieved 8 December 2008. ↑ "Why Is There a Controversy Surrounding the Word 'Xmas'?". tlc.howstuffworks.com. Retrieved 25 December 2012. ↑ "Christmas According to Marx and Lenin, by Ronald Reagan". lc.org. 22 December 2011. Retrieved 31 December 2012. ↑ Keck, Kristi (18 December 2009). "Heated Debate Again over 'War on Christmas' Claims". CNN. Retrieved 25 December 2012. ↑ Altman, Alex (24 December 2008). "A Brief History of the War on Christmas". Time. Retrieved 25 December 2012. ↑ Linkins, Jason (7 December 2008). "O'Reilly's War on Christmas Goes Retail". The Huffington Post. Retrieved 21 December 2008. ↑ Grossman, Lynn (18 December 2008). "Mandatory 'Merry Christmas' Line May Lose Its Lilt". USA Today. Retrieved 21 December 2008. ↑ Schweitzer, Jeff (3 December 2014). "A War on Reason, Not on Christmas". The Huffington Post. Retrieved 12 December 2014. ↑ "2007 Federal Holidays". United States Office of Personnel Management. Retrieved 25 December 2012. ↑ Ostling, Richard (1 December 2005). "Have Yourself a Merry Little Lawsuit This Season". Buffalo Law Journal. Vol. 77 no. 96. pp. 1–4. ↑ Boston, Rob (December 2007). "Is There a 'War on Christmas'?". Americans United. Retrieved 25 December 2012. ↑ Wakin, Daniel (11 December 2002). "Lawsuit Attacks Schools' Ban on Nativity Scenes". The New York Times. Retrieved 25 December 2012. ↑ Richey, Warren (22 February 2007). "Nativity Scene Is too Religious for New York City Schools". The Christian Science Monitor. Retrieved 8 December 2008. ↑ Pearson, Matthew (1 December 2011). "Parents' Anger as Ontario School Replaces Christmas Concert with Non-Denominational February Fest". National Post. Retrieved 25 December 2012. ↑ "Winterval Gets Frosty Reception". BBC News. 9 November 1998. Retrieved 23 December 2011. ↑ Burkeman, Oliver (7 December 2006). "The Phoney War on Christmas". The Guardian. London. Retrieved 25 December 2012. ↑ Mitchinson, April (29 November 2009). "Differences Set Aside for Winter Night Light Festival in Dundee". The Press and Journal. Aberdeen. Retrieved 29 November 2009. ↑ "Hark, the Herald Angels Are Back on This Year's Christmas Stamps". The Daily Mail. London. 6 November 2007. ↑ "CRL Rights Commission Continues with the Consultative Community Hearings on the Possible Review of Public Holidays". info.gov.za. 26 June 2012. Retrieved 2 November 2012. ↑ "Fight over Religious Holidays". CRL Rights Commission. Retrieved 2 November 2012. ↑ "Hands off Christmas, Protesters Say". News24. 10 November 2012. Retrieved 10 November 2012. ↑ "Recommendations: Public Holidays vs Religious/Cultural Holydays" (PDF). CRL Rights Commission. Retrieved 23 April 2013. ↑ "Public Holidays Scrutinised". eNCA (Video). 29 April 2013. Retrieved 30 April 2013. 1 2 Sylte, Turid & Omvik, Eirik (12 December 2013). "7 av 10 vil ha skolegudstjenester" [7 out of 10 will have school worship]. Vårt Land (in Norwegian). Retrieved 12 December 2013. ↑ "Skolegudstjenester og kirkeasyl]". Dagen (in Norwegian). Retrieved 12 December 2013. ↑ "Upprop för skolavslutningar överlämnat till utbildningsministern". Kyrkans Tidning (in Swedish). Retrieved 12 December 2013. ↑ "Ja till skolavslutning i kyrkan". Folkpartiet.se (in Swedish). 27 November 2012. Retrieved 12 December 2013. ↑ "Var sjätte skola har bytt jultraditioner efter ny lag" (in Swedish). Sveriges Radio. 7 December 2012. Retrieved 12 December 2013. ↑ Berthelsen, Morten (17 December 2009). "Rabbis Versus Christmas: Religious Rivalry in Jerusalem Benefits No One". Haaretz. Retrieved 25 December 2012. ↑ "Brussels' Modern-Art Christmas 'Tree' Triggers Outcry, Tensions, Petition". The Globe and Mail. Toronto. 26 December 2012. ↑ "Abstract Christmas Tree Sparks Protests in Brussels". BBC News. 1 December 2012. ↑ Kong, Dave (18 June 2002). "Letter to the Committee on Governmental Organization RE: SB 1577 Redesignation of State Holiday Tree as a Christmas Tree". sfatheists.blogspot.com. Retrieved 25 December 2012. ↑ "Governor and First Lady Celebrate 76th Annual Christmas Tree Lighting" (Press release). Office of the Governor of California. Retrieved 25 December 2012. ↑ "Governor Plugs Christmas Back into State Tree-Lighting Ceremony". Lodl News Sentinel. Associated Press. 3 December 2004. p. 5. Retrieved 26 December 2012 – via Google News. ↑ "Mich. Capitol Conifer Re-Christened 'Christmas Tree'". FirstAmendmentCenter.org. 30 November 2006. Retrieved 29 December 2012. ↑ Bauer, Scott (12 December 2007). "Bah Humbug Bill to Rechristen Holiday Tree Fizzles on Way to Senate". The Capital Times. Madison, WI. Association Press. Retrieved 29 December 2012 – via HighBeam Research. (subscription required (help)). ↑ "Active Hate Groups in the United States in 2014". Southern Poverty Law Center. ↑ McEwen, Alvin (November 23, 2010). "Family Research Council, American Family Association Named as Anti-Gay Hate Groups". Huffington Post. HuffPost Politics. Retrieved April 22, 2011. ↑ Waddington, Lynda (November 23, 2010). "Groups that Helped Oust Iowa Judges Earn 'Hate Group' Designation; SPLC Adds American Family Association, Family Research Council to List". Iowa Independent. Archived from the original on December 2, 2010. Retrieved November 25, 2010. ↑ Cohen, Adam (7 December 2005). "Commercialize Christmas, or Else". The New York Times. Retrieved 14 November 2012. ↑ Popper, Nathaniel (16 December 2005). "Boycotts Bloom as Religious Conservatives Wage Battle Over Christmas". The Jewish Daily Forward. New York. Retrieved 14 November 2012. ↑ "Sears Puts 'Merry Christmas' Signs in Its Stores". NewsMax.com. 7 December 2005. Retrieved 30 December 2012. ↑ Strode, Tom. "Target, Sears Say They'll Include 'Christmas'". Silas Partners. Retrieved 30 December 2012. ↑ "Wal-Mart Opts for 'Christmas' Marketing". MSNBC. 15 November 2006. Retrieved 5 December 2006. ↑ "Merry Christmas Target". Snopes.com. 9 December 2005. ↑ "Target Includes 'Christmas,' AFA Drops Boycott". NewsMax.com. 9 December 2005. Retrieved 30 December 2012. ↑ "Wal-Mart Opts for 'Christmas' Marketing". MSNBC. Associated Press. 15 November 2006. Retrieved 28 January 2007. ↑ "Best Buy Christmas Ban". Snopes.com. Retrieved 30 December 2012. ↑ Birkey, Andy (19 November 2009). "War on Christmas Comes to Minnesota". The Minnesota Independent. Retrieved 30 December 2012. ↑ Saltzman, Russell (22 December 2011). "Call it Christ's Mass and Let Best Buy Keep the Holiday". FirstThings.com. Retrieved 30 December 2012. ↑ "Lowe's Says 'Family Trees' a Mistake". WorldNetDaily. 14 November 2007. Retrieved 2 December 2014. ↑ "Lowe's Listens: 'Christmas Trees'". WorldNetDaily. 29 November 2005. Retrieved 2 December 2014. ↑ Monroe, Irene. "The Right's Bogus War on Christmas". LA Progressive. Retrieved 30 December 2012. ↑ "Home Depot: Hanukkah, Yes! Holidays, Yes! Christmas, No!". TheScroogeReport. 29 October 2008. Retrieved 30 December 2012. ↑ "Home Depot Christmas". Snopes.com. Retrieved 8 December 2008. ↑ "Boycott Gap, Old Navy and Banana Republic this Christmas". American Family Association. 11 November 2009. Retrieved 31 December 2012. ↑ Miller, Leslie (23 November 2009). "The Gap's 'Happy Whatever-you-Wannukah' Ad Reignites 'War on Christmas' Debate". USA Today. Retrieved 6 December 2009. ↑ "Gap Responds: Should the Boycott End or Not? You Decide". American Family Association. 17 November 2009. Retrieved 31 December 2012. ↑ "'Very Strong' Christmas Ad Prompts AFA to Suspend Gap Boycott". Christian Post. Retrieved 2 December 2016. ↑ Evans, Terry (3 December 2010). "Chase Orders Southlake Bank to Remove Christmas Tree". Fort Worth Star-Telegram. Retrieved 13 December 2010. ↑ Samuel, Stephanie (7 December 2010). "Wachovia Bank Allows Christmas Trees in Branch Offices". The Christian Post. Retrieved 8 November 2014. ↑ Bloomquist, Sarah (2 December 2010). "'Christmas' Returns to Philly's Christmas Village". Philadelphia: WPVI-TV. Retrieved 31 December 2012. ↑ "长沙现大学生着汉服举标语"抵制圣诞节"". NetEase. CFP. 25 December 2014. Retrieved 19 November 2015. ↑ "Brouhaha over Starbucks Red Cups More of a Joke than a Controversy". CBC News. Retrieved 12 November 2015. ↑ "Donald Trump Suggests a Boycott of Starbucks and Its Plain Red Cups". Washington Post. Retrieved 12 November 2015. ↑ "Here's Why People Are Mad About Starbucks' Red Cups". Fortune. Retrieved 12 November 2015. ↑ "Jehovah's Witness on Christmas". www.jw.org. Retrieved 1 January 2013. ↑ "Messianic Judaism: The Followers of Christ Who Do Not Celebrate Christmas". The Christian Post. 8 December 2011. Retrieved 1 January 2013. ↑ "Is Christmas Biblical?". tjc.org. Retrieved 1 January 2013. ↑ "Frequently Asked Questions (FAQs)". churchofgod-7thday.org. Retrieved 1 January 2013. ↑ "All About Iglesia ni Cristo: Frequently Asked Questions". iglesianicristowebsite.com. Retrieved 1 January 2013. ↑ "'Christ' in Christmas? : Churches of Christ and the Holiday Season". Christian Chronicle. Retrieved 2 January 2013. ↑ "Santa Not Welcomed: Turkish Campaigns". OnIslam.net. 25 December 2013. Retrieved 5 November 2014. ↑ "Turks Protest Against 'Creeping Christmas'". Middleeasteye.net. 23 December 2015. Retrieved 26 December 2015. A history of the War on Christmas/Christianity in images and video. Naughty & Nice: A History of the Holiday Season Public radio program explores the contentious history of Christmas and other winter holidays in America. I'm Dreaming of a Right Christmas Vision Magazine facts about Christmas. Christmas: An Untold Story The United Church of God's arguments against the current manner of celebrating Christmas. "It's Time for the Annual War on Christmas" An argument denying the existence of a "war on Christmas". "How the secular humanist grinch didn't steal Christmas" An article analyzing the so-called "war on Christmas" and arguing that it is not an actual movement but rather a creation of right-wing conservatives designed to advance their political goals. "The War on Christmas, or How to Build Mass Support for Right Wing Ideology" An article that traces the intellectual roots of the war on Christmas in the conservative movement.